Summer may mean it’s time for outdoor fun in the sun, but it’s also prime time for a number of pests. All that extra time outdoors can bring everything from poison ivy rashes to exposure to Lyme disease from tick bites. And of course there’s that ubiquitous summer menace, the mosquito. Predicted change in the range of the Asian Tiger mosquito with warming from high levels of greenhouse gas emissions. Is there any pest more synonymous with summer than the mosquito? There are many species of the annoyingly buzzing biters found in different areas around the country. While some are merely an itchy nuisance, others come with the risk of spreading diseases like malaria, West Nile virus and dengue fever, including the invasive Asian Tiger mosquito, which first appeared in the U.S. in 1985. As temperatures around the country rise, the areas that are conducive to such mosquitoes could expand, and the insects could start to emerge earlier in the year, meaning more opportunities for bites that could spread disease. After an unseasonably warm late spring, summer, and early winter in 2012, the U.S. experienced a West Nile Virus outbreak linked to the Asian Tiger mosquito, with some 5,600 people becoming infected. Asian Tiger mosquitoes tend to die off when temperatures venture outside a range from 50°F to 95°F and when relative humidity dips below 42 percent. 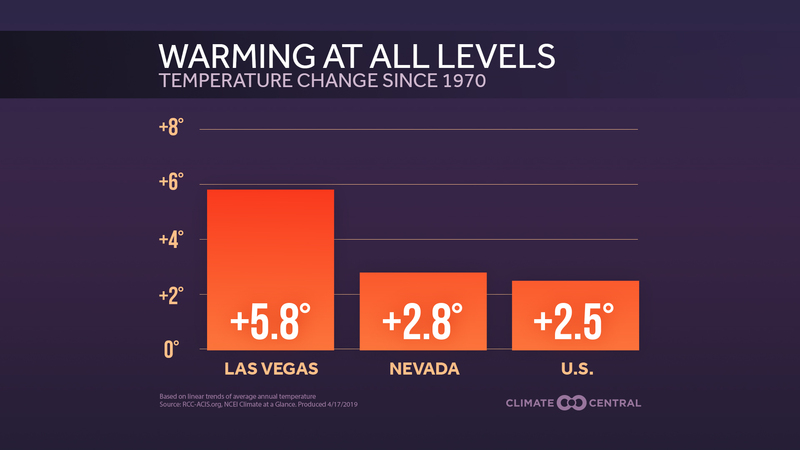 A Climate Central analysis examined how warming would affect this range for cities around the country, showing how many more “mosquito suitable” days there were now compared to 1980. See how your city has fared in the dropdown menu below. One key question in terms of the health impact of expanded mosquito territory is whether the new climates they venture into will be as welcoming to the pathogens they can carry. Arizona has a lot of Aedes aegypti mosquitoes, another invasive mosquito species, but no dengue, which it can often carry, Mary Hayden, a scientist with the National Center for Atmospheric Research in Boulder, Colo., said. Why this is isn’t known, but Hayden and her colleagues suspect it is because the harsh desert climate doesn’t allow the mosquitoes to live long enough for dengue to undergo its full development cycle. But there have been small outbreaks of dengue in Texas near the Mexican border, Hayden said, as well as a disease found in the Caribbean, called chikungunya, in Florida. Health officials are closely watching these areas for larger outbreaks, she said. Time to stock up on the calamine lotion. 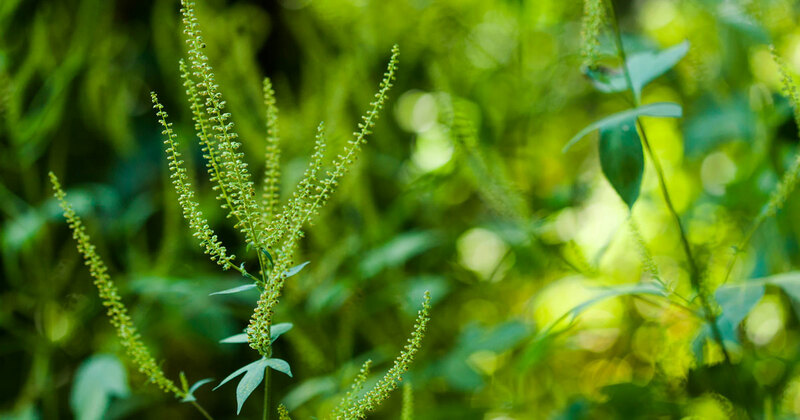 Poison ivy is a well-known scourge for those who spend time outdoors in the summer. Already more than 350,000 cases of poison ivy occur annually in the U.S., according to the National Wildlife Federation, and that number could go up as the climate changes. The impacts of climate change on poison ivy have more to do with the cause behind rising temperatures than the warming itself. Plants need carbon dioxide — the key heat-trapping greenhouse gas — to fuel photosynthesis. 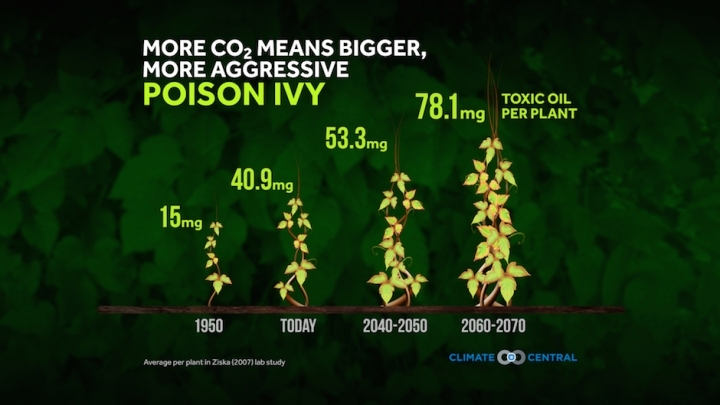 Experiments that exposed poison ivy plants to different levels of CO2 have found that “poison ivy grows faster when there’s more CO2” and it produces more leaves that carry the plant’s toxic oil, Doug Inkley, a NWF scientist, said. Those oils, which put the “poison” in poison ivy, can vary in their chemical structure, and high CO2 levels also cause the plants to produce a more toxic form, “so climate change is not doing us any favors there,” Inkley said. 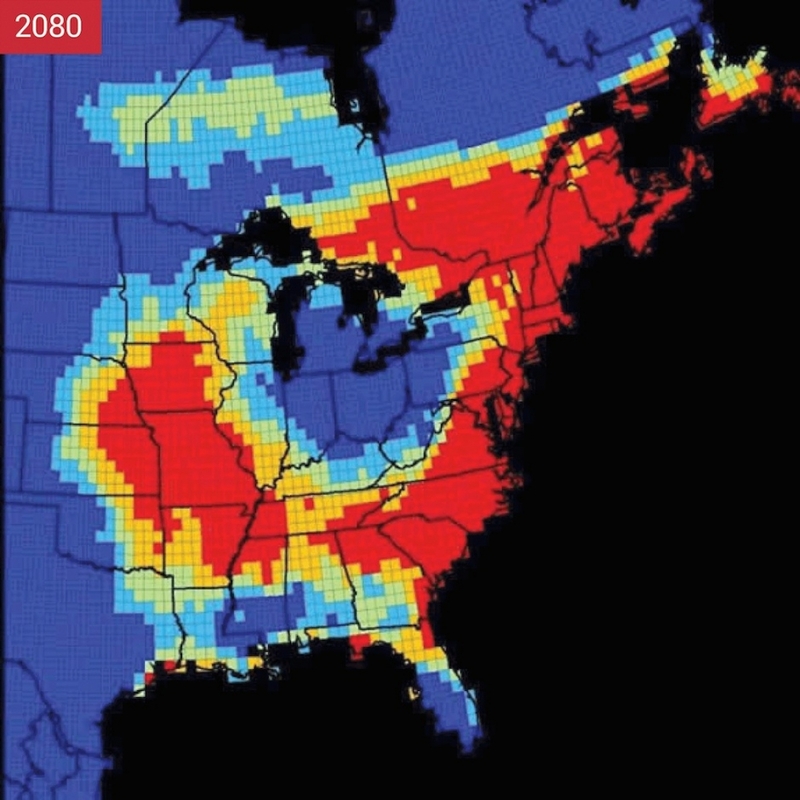 Expected range of deer ticks with warming by 2080. Anyone who’s been out for a walk in the woods on the East Coast is familiar with the phrase “tick check.” The main reason for such concern over these tiny creatures is the ability of certain species, in particular the so-called deer tick, to transmit diseases such as Lyme disease and anaplasmosis. As temperatures rise, there is concern that ticks could spread into newly suitable habitat and bring Lyme disease and other pathogens with them. They have already expanded northward into Canada, where the number of reported cases of Lyme disease doubled between 2009 and 2012, according to Canadian government figures — a trend attributed to more locally acquired cases. That northward expansion is expected to continue, as shown in the National Climate Assessment, while a much smaller retraction on the southern end of their range is also anticipated. The worry is that people who aren’t used to having to think about Lyme exposure won’t know to take proper precautions to reduce their risks. Warming could also cause explosions in tick populations, as higher winter temperatures fail to thin out overwintering populations, Inkley said. More ticks means more chances for Lyme to be transmitted. Earlier thaws and later frosts could also mean that ticks are active for a longer period, again increasing the risk of Lyme transmission. But, just as with mosquitoes, it is unclear whether changes in the climate and conditions of new habitats will be as conducive to the Lyme bacterium and other diseases as they are to ticks. 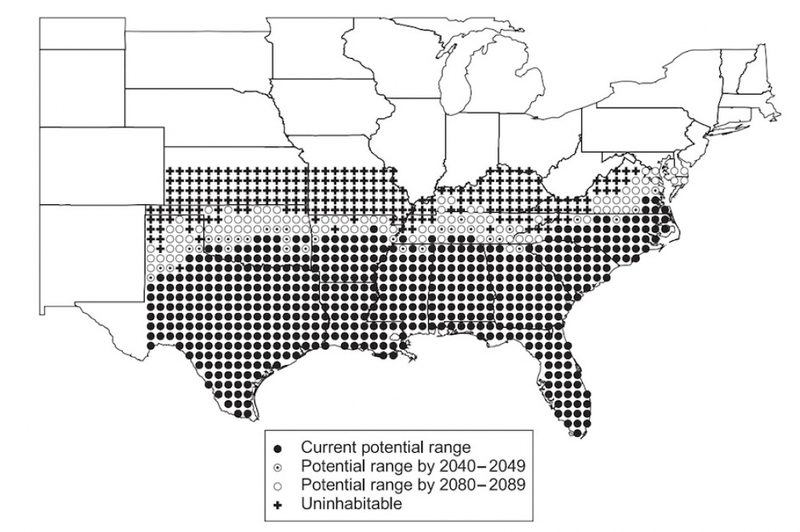 Possible expanded range of the imported red fire ant with climate change. Click image to enlarge. Credit: L.W. Morrison et al. This last pest is another invasive species. The imported red fire ant, as it is colloquially known, came to the U.S. from its native South America sometime in the 1930s or ‘40s, likely as a stowaway in ship ballast. The species now covers more than 300 million acres, mostly in the Southeast, where it came ashore, according to the NWF. With warming, those low temperatures don’t get as cold, meaning colonies could be less inhibited. 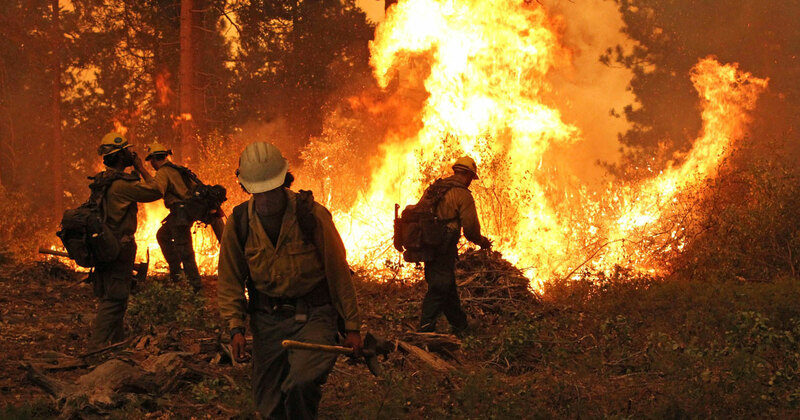 Morrison did a study in 2005 that modeled the potential expansion of the imported red fire ant with climate change and found that warming temperatures would expand suitable habitats by about 5 percent by mid-century and then by 21 percent towards the end of the century. This would mean imported red fire ants could be found as far north as Nebraska, Kentucky and Maryland. And while these ants can certainly provide an unpleasant encounter for any unwitting humans who come across them — their en masse bites inject their victims with venom that produces a burning sensation and raises blisters that can become infected — they are actually more of a threat to local wildlife. Swarms of ants can easily overwhelm young birds in ground nests and small animals like mice, Inkley said. Thinking about all of these summer fun-ruining pests may have you scratching some imaginary itch and eyeing the outdoors warily, but it doesn’t mean you can’t enjoy what nature has to offer, Inkley said. “We strongly believe that people should get out of doors,” he said. It just means being vigilant and prepared for nature’s not-so-nice side.